1. Just bowl and watch the screen. 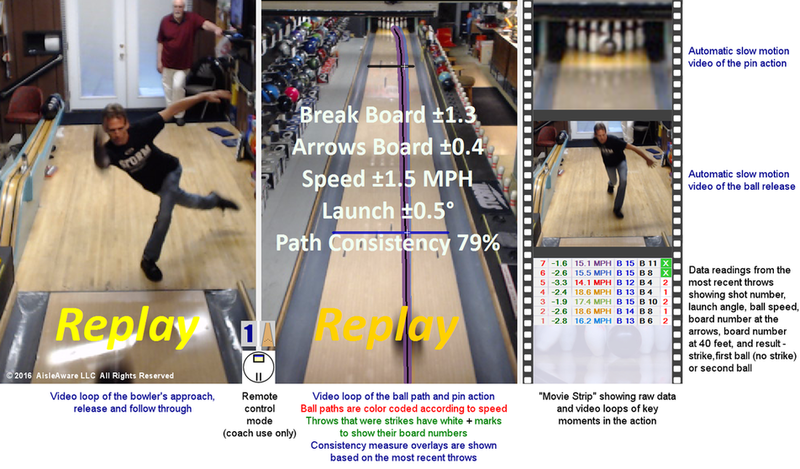 Strike Seeker is completely automated and will show camera replays, key ball data, and consistency analyses - all automatically. Look at the screen after every shot to see several replay loops. There is nothing to learn about using the software! Just throw the ball and let Strike Seeker do the rest. 2. Use the wireless remote control. Pause the replay and then step forward and backward through the video loops. Switch between available camera views. Review and print ball data. 3. Use the keyboard and mouse. Draw lines, arrows, rectangle, circles and measured angles. Add and select students in the bowler database. Start and record training sessions for a specific bowler, then e-mail results when the lesson is finished. Set up target ball speeds and board numbers and activate voice feedback for self-practice. Select lane oil patterns to overlay onto the lane for competition prep. The Strike Seeker screen. Bowlers and coaches don't lift a finger to see all of this information on every throw! Rent Strike Seeker lanes out to league and competitive bowlers for self-practice. Strike Seeker is always on and ready so it takes little or no attention from your front desk staff or maintenance crew. Charge additional lineage when bowlers are using Strike Seeker. Gain the competitive edge over other nearby centers by making the training experience at your location more memorable. Attract and retain local high school and college teams that train and compete at your facility. Host more clinics or increase the number of paying attendees to existing events. Increase the value and enjoyment of lessons and charge a premium for lessons that use Strike Seeker. Happy customers lead to repeat customers and referrals! Focus on your students and not on running the equipment since Strike Seeker is always recording data and video automatically! Use the camera views and drawing tools to improve communication with your students by showing them not just telling them. Eliminate coach/student contention over differences in perception during lessons to keep the student open to your guidance. Sell flash drives to students with video recordings and coach/student discussions from their training sessions for further study. Add value when selling bowling balls by using Strike Seeker to show your customers the difference their new ball makes. Convert customers who buy new bowling balls from you into students who take lessons from you. Video of Strike Seeker in action. Make sure to like our Facebook page for more videos and updates! The Strike Seeker wiki is now available!